Trapped between two flooded creeks? Worried we would miss our flight out of Tasmania and home? Wondering if we had enough food to eat until the rivers subside? 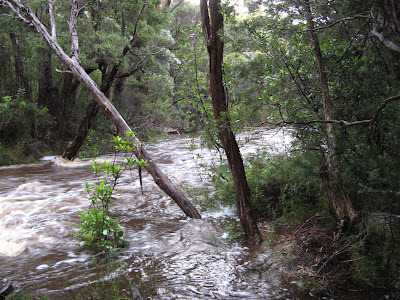 Sudden thunderstorms in Tasmania can make even small creeks flood quickly and to high levels. 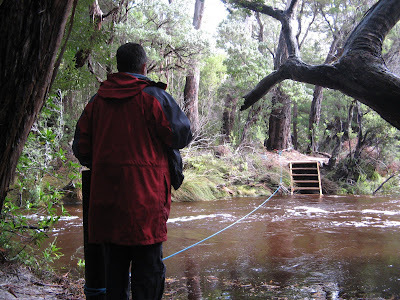 On a recent trip into the South Coast of Tasmania we experienced the effects of a heavy thunderstorm and rain on two “small” creeks. It left us stranded between the two flooded creeks, that were 700 metres apart, for 10 hours. Luckily the rain stopped and we were able to cross or we may have been there for several days. The full story continues below. 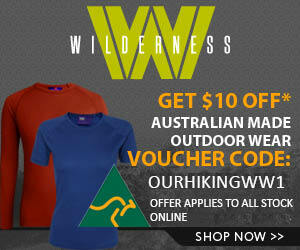 We had spent a fantastic three nights at Louisa Bay and on the way back to Melaleuca we camped at Louisa Creek. The plan was to head out early the next morning to Buoy Creek at Cox’s Bight for another day exploring this beautiful area. About 7pm on Monday 23rd we were cooking dinner and a bit of thunder and lightening started around us. We were well set up and as the rain started we retreated to the tent and tried to get some sleep. The rain continued all night and Sue was getting increasingly concerned as first her “Crocs” and then boots started to float in the vestibule of the tent. Frank was getting “a bit cross” with her as she was constantly unzipping the tent and checking on the water level (about 3″ deep on her side while dry on mine). FINALLY we got some sleep as we (she) got used to the heavy rain and what sounded like wind in the trees. We woke early, keen to head off as the rain had stopped. 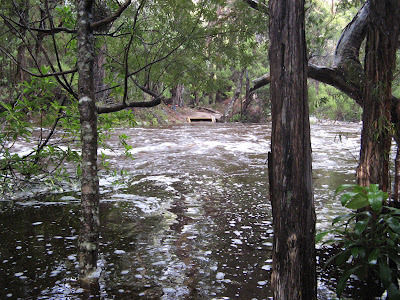 Upon arising we worked out what the “wind” sound was, it was the Louisa Creek in ?full flood. Boy that little, foot deep stream had risen overnight. 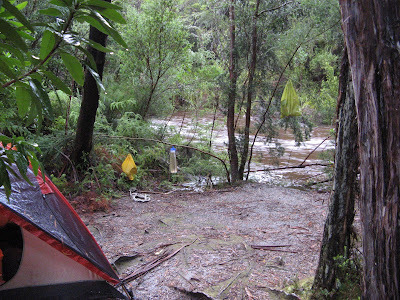 It was now a 2.5 – 3 m torrent…..
We wacked a marker stick in to gauge if the river was rising and within a couple of minutes the water had risen beyond the stick and was heading to our tent. Discretion being the better part of valor and finally agreeing that Sue was right- “yes dear, the river could flood our tent”, we moved to higher ground and checked out the crossing. As the river level at Louisa Creek has fallen a lot, we decided at about 1200 to walk the 700 m over to Faraway Creek and check out if it was possible to get across that day. 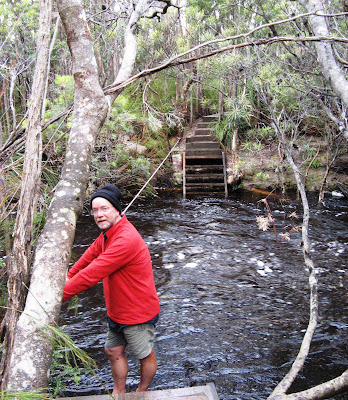 When we arrived we were STUNNED, we thought the level would have dropped at around the same rate as Louisa Creek but this one was even higher. We were so stunned we forgot to take a picture but the water was a foot above the flood warning sign and RISING rapidly. Faraway Creek was running even faster and stronger than Louisa Creek. We retreated to Louisa Creek and lunch (well a modified lunch, we were thinking if the rain kept up we might need to stretch our food out for a few days…..) It was again raining heavily. 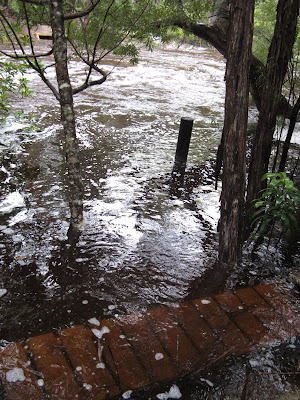 On our return, Louise Creek had risen to the top of the steps again. Boy these rivers are responsive to rain! We waited until about 4pm and Louisa Creek had fallen again so we walked over to Faraway Creek again and discovered it had fallen DRAMATICALLY AND there were about 20 South Coast Track hikers on the other side……..
After about an hour the level had dropped enough to warrant an attempt to cross and Frank ended up getting 3 of the more adventurous across (including a non swimmer). We made a snap decision to head back to our gear, pack up and get across. Looking back after getting across. The water was about 2 feet above the top piece of step you can see on the far side. We headed through the temporary village that had been created at about 7pm and walked on for about 2km in our Crocs , finding a great spot next to the track and set up for the night, VERY happy to have the last major river crossing behind us. 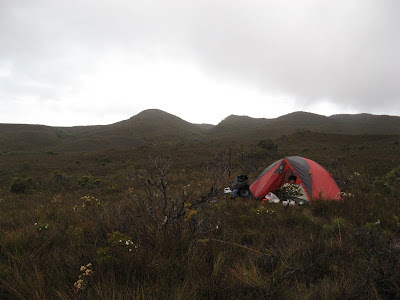 Next day we did 23km into Melaleuca and had a couple of nights around there. We ran into a guy who had flown in to check out the area after we think, abandoning a walk at we THINK 5 mile creek in the Arthurs area. They woke to water filling their tent in the middle of the night and a VERY CLOSE NEAR DROWNING incident. He recalled standing with his pack on, water to his chest with no where to go. He thought he was going to die and the look in his eyes told us it was true. The party lost 3 cameras, multiple gear including boots etc. He was VERY happy to be out. 3) It can be VERY boring watching a river drop, take some cards or a good book and chill. 4) It is TOTALLY out of your control, accept it (we talked to some very cross people who now had to flog themselves across the track to finish at a certain time) We had 2 spare days. There is a great information sheet on techniques to cross a river at this site. 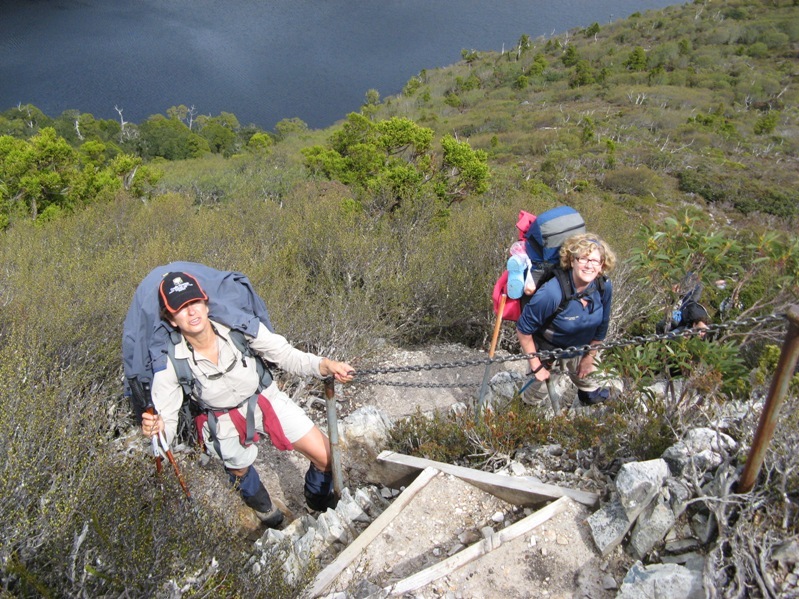 It is produced Mountain Safety in New Zealand. Glad you all got back safe and sound. Wow…that’s quite an adventure! Perhaps a little lesson to be learnt here. I finished my last hike with two tea bags in my pack. No spare food at all! Happy to know you made it back safely anyway. Wow, that’s an impressive and memorable tale to be able to tell, and it’s good to hear you got out safely. I’m definitely hoping to visit Tasmania some time — I have a South Australian friend who visits Tassie a lot and she’s frequently raving about it. Steve: hiking holidays are great, get out there! Family Tents: At least we were not (too) wet. It was great fun, only scary because we were not sure how long we would be stuck and only had a day or two food AND flights to catch back home. It is an absolutely beautiful part of the world. Good read Sue and Frank. Lends more weight to the option of flying in and walking out – you aren’t on a deadline to catch a plane (If the plane can land!). Seeing that you wrote the article in 2009, I hope you have now managed to make it to NZ. The sand flies ONLY bite you when you stand still (Some Maori curse I’ve been told) – if you keep moving you are fine! BUT it is hard eating and putting up a tent while you are moving!!! The kiwi midges don’t seem to like Eucalyptus Oil (also seems to work for leeches). Flooding can catch a lot of people. We were amazed by the amount of water and its strength. No, we have not made it to New Zealand yet 😉 – One day! Love the Maori curse idea.